Fishing Methods Have Evolved : Initially (50-60 years ago) in the Pacific Northwest about all the steelhead fishing was done from the bank of a river, by casting and drifting through a run. Some that had boats would float down a river dragging plugs. The basic gear then was a fiberglass rod from 8 to 9′ long and a level-wind reel. Some of us thought those old Pflueger Supreme reels were the cat’s meow. However I challenge you to compare them with today’s casting reels, the old ones are not even in the same world. Then along came the Ambassadeurs, which seemed to dominate the river bank, and some can still be seen. You would not see a lot of the open faced spinning reels early on as the quality was not that good. Bearings were basically non existent, just a shaft through a aluminum cover, or possibly a bronze bushing. Pot metal or plastic gears did not last long for the serious steelheader. The old Mitchell 300 spinning reels functioned, but were not the smooth running, had a jerky drag and many times after continued use on large steelhead, would fry the internal pot metal gears. I still have a functioning Airex-Bache Brown #5 spinning reel that I bought new in May of 1955 along with the Betts 8′ 6″ solid glass steelhead spinning rod. This was a durable rod but not that sensitive. Line and leader was always monofilament, using pencil lead as a weight. This lead could be attached to a dropper by using a surgical tubing coupler or by flattening one end and punching a small hole in the lead, then snapping the lead onto a snap swivel. 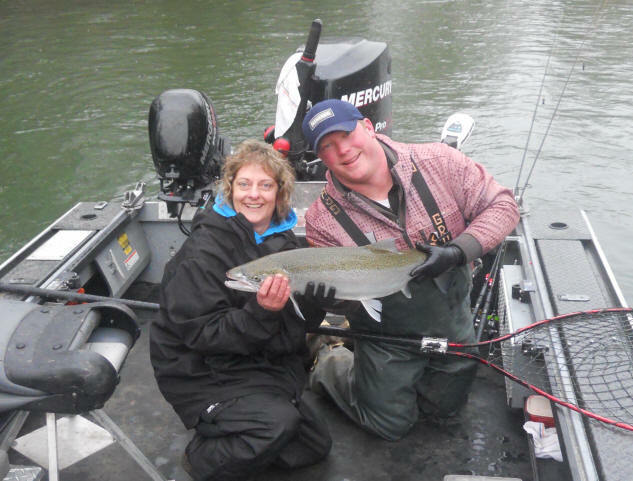 The lure was usually salmon/steelhead eggs cured in borax. In use, you cast out into a seam, let the lead bounce bounce along the bottom, with a short leader to the bait which of course followed the lead. You maintained control, holding it up off the bottom just enough to hope you did not get tangled in rocks or an underwater limb. The secret was to be able to distinguish between the weight tapping the bottom between the hesitation/pickup by a fish. You usually set the hook on nothing or a rock many more times than it was a fish. If you missed this “bite”, you may not have known it was there until you reeled back in and the eggs were partly stripped off. It took a lot of experience to be able to distinguish between rock bite and fish bites. Then someone concluded that maybe if you added some colored yarn to the egg bait, that the fish would get their teeth tangled in the yarn, giving the fisherperson a bit longer time to set the hook, once they felt the bite. About that time, another idea was born, add a small floating object on the line next to the eggs. This allowed the eggs to float up about a foot off the bottom and nearer to where a suspected steelhead may be laying. This brought into being the Okie Drifter. Then some fishermen found that just the Drifter and yarn would catch fish. Then Corkies and other imitations of the Okie were invented, and of course performed the same as the Okie. So then you had a variety and of course different colors to choose from. As for artificials, a friend of mine who was a steelhead fisherman came up with a lure that he called a “pocket shrimp”. It was made rather simply by using a 1′ foam sheet, spray painting each side with a bright florescent orange paint, then using a spent 270 Winchester cartridge case with the head cut off, he cookie cut out many of these about 1/4″ round foam slugs that had a bright orange eye on each end. He simply slid the foam under the egg loop on his hook with 1/2 of it protruding on each side and we caught fish with or without eggs. The foam helped float the hook up off the bottom. As time went on, sand shrimp became the bait of choice. And rightfully so as this was one of the natural types of food that these fish were accustomed to eating when they spent their time in salt water. The good part about this bait is that you could dig your own about any time of the year if you were in a location where they were, or purchase live ones in pint foam containers at bait stores. This helped considerably as good roe/eggs could be hard to come by and expensive many times during the year. For a while spinners and spoons were the rage and yes they do catch fish. With the spinners being easier to fish, but if you put in your time and pay your dues with a spoon it can work quite well. It still has it’s place in certain water. Did I forget to mention plugs? These could be Flatfish or Wriggle Warts, both of which have proven themselves. Now you will now even see usage of pink rubber worms. All the while rods underwent great improvements. The solid glass rods became obsolete years ago, being replaced by hollow fiberglass which were considerably more sensitive. Then as time passed, Graphite was introduced into rod manufacture and we got lighter, longer and MORE SENSATIVE rods. Then a composite of the Graphite and fiberglass came along for for light, sensitive and REALLY STRONG rod. Reels improved, some still use the level-wind “baitcasters”, where the Ambassadeurs are still hard to beat, but probably more have shifted to the newer multi stainless steel ball bearing open faced spin casting reels. And drags were improved greatly. As for line, many still use monofilament, while some have shifted to the non stretch braid type. Each has it’s benefits and places, so unless you try the braid, don’t cut it down. Sinkers have also went through a change. Slinkies slid into being. These are nothing more that brown parachute cord filled with lead buckshot balls and seared on the ends encapsulating the lead. The cord is porous enough to allow you to snap a snap swivel into one end just like you did with pencil lead. Different weights could be made using 3 , 4, 5, or more lead balls. These seemed to slither along a rocky bottom better than the solid pencil lead, equating to less snag-ups. Plus the fish’s bite was easier to detect. Then from north of the boarder we were enlightened with floats. Sure you probably used floats for fishing for trout or perch years ago. But these were improved. You now will see many different styles, some made of hard foam and like large eggs, others simply a 1/2″ foam rod with a hole diagonally through it to allow the line to pass through. In use your line wrapped partly around the foam rod, holding it in place on the mainline. These foam rods look amazingly like “Backing Rods” sold a a building supply business for taking up excess gap before the hole is caulked. Some use a bead above and below with a special float slider knot that can be adjusted rather quickly to change your depth of to the lure. Some fishermen hate to admit they are using a float, so you may hear the term “Strike Indicator” being used, same old float, just different name applied to it. Now with the float, a bankie can cover water a lot more that just beating it with a spinner, spoon or eggs. With the float, you can still use bait, or in the last few years a small lead-head jig has proven very effective, especially under Strike Indicator. This also helped the novice greatly as being able to “Read” the river was not as important now as it was years ago. Now for a boater, being able to drift peacefully down a river casting into likely seams works quite well. This is usually done with a drift boat and the rower, just slightly not maintaining position, but slowly backing down the river. The rods are out and the person in the center can be “backdrifting”, this has also been called “boondogging”. Others in the boat could of course cast out to the side and reel back in. However the hardest part of this was that if you drifted very far down river, you had to make arrangements to have your vehicle and trailer driven down to your take-out. One fisherman I know carries a small motor scooter in his drift boat so he can use it to go back upriver to get his vehicle. 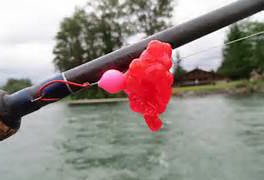 In the photo below, you can see the lure on the rods, a pink corky and salmon eggs. This fish would have been taken side-drifting. Then the jet sled boat enters the scene. This allows the fishermen to cover a lot more water, drift, usually using a electric trolling motor to maintain position, then at the end of the drift, power up and run back upstream to make another pass or back to the launch. Here the boat can be drifting either parallel or 90 degrees to the shore, casting and retrieving as needed to cover all the water. This has become known as “side-drifting”. Now combine this with the float system and you have the best of both worlds in “bobber drifting”. And now we have a lot of premade roe cures as compared to just the borax. Most of these have a choice of bright colors if that is what you want, and bite enhancement additives included. Some of these colors are so penetrating that many bait fishermen now wear surgical gloves to protect the finger coloration as seen in the header photo above. And all the while our tackle boxes needed to be updated with all the new stuff. One note that you can observe when you see a photo of a fish being held just out of the water. If the fish’s eyes are looking straight out, it is dead, but if the eyes are looking down, it is still alive.